Low C-C chemokine receptor 1 (CCR1) and interleukin (IL)-10 expression is associated with risk of Behçet’s disease (BD). The objective of the present study was to clarify the pathological roles of CCR1 and IL10 loci identified by previous BD genome-wide association studies (GWASs). M1 and M2 macrophages (Mφ) were differentiated with granulocyte-macrophage colony-stimulating factor or macrophage colony-stimulating factor (M-CSF) from peripheral monocytes of healthy control subjects (HC) and patients with BD. Expression of CD68 and CD163 was evaluated to test for Mφ polarization. CCR1 and IL-10 messenger RNA (mRNA) and protein expression was compared according to CCR1 and IL10 single-nucleotide polymorphism (SNP) genotypes. The migratory ability of M1 and M2 Mφ toward CCR1 ligand macrophage inflammatory protein (MIP)-1α was compared. The ratio of M1 and M2 Mφ in skin lesions of BD and systemic sclerosis (SSc), which was reported to be M2 Mφ-dominant, was compared. To examine the plasticity of polarized Mφ, the differentiated cells were cultured with either the same or the other culture condition. Preferential expression of CD163, CCR1, and IL-10 was found in M2 Mφ compared with M1 Mφ. M2 Mφ migrated more sensitively to low concentrations of MIP-1α than M1 Mφ did. BD-derived M1 Mφ showed higher CCR1 surface expression than HC-derived M1 Mφ did. IL10 and CCR1 mRNA expression differences were observed by GWAS-identified SNP genotypes in polarized Mφ. BD skin lesions showed M1 Mφ predominance compared with SSc skin lesions. A plasticity assay revealed that M-CSF restored IL-10 synthesis and reduced IL-6 production by M1 Mφ. The present study reveals that GWAS-identified SNPs contribute to M1 Mφ-predominant inflammation in BD. Our data also suggest that the skewed Mφ polarization is correctable by immunological intervention. Behçet’s disease (BD) is an idiopathic inflammatory disease that affects multiple organs, including the skin, eyes, vasculum, and mucosa [1, 2]. Genetic factors such as HLA-B*51, as well as environmental factors, including microbial components, have been implicated in the pathogenesis of BD . Recent genome-wide association studies (GWASs) followed by subsequent genetic studies have identified nearly 20 loci as the disease susceptibility genes, most of which are involved in both innate and acquired immune systems [4–10]. 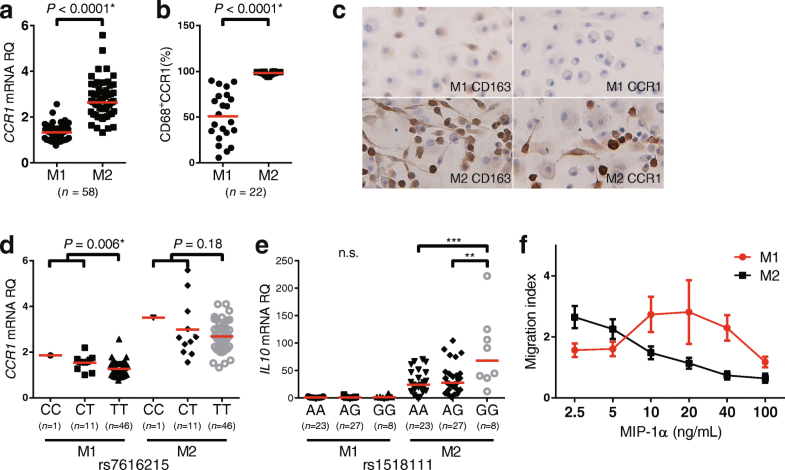 Of them, IL10 and CCR1 are highly expressed genes in macrophages (Mφ). IL-10 is one of the cytokines conferring the anti-inflammatory effect, involved in the pathogenesis of various autoimmune diseases, including systemic lupus erythematosus (SLE) and inflammatory bowel diseases (IBD) . Some studies have shown evidence that IL-10 is increased in BD inflamed tissues [12, 13]. However, genetic studies revealed that a BD risk single-nucleotide polymorphism (SNP) allele is associated with lower interleukin (IL)-10 production [4, 6], implicating complex interaction of T-helper cell Th1, Th2, and Th17 cytokines in BD . CCR1 (C-C chemokine receptor 1), a membrane receptor for chemokines such as macrophage inflammatory protein (MIP)-1α, is known to be expressed on myeloid cells and is involved in cell migration . We previously reported that the disease risk allele of IL10 locus rs1518111 is associated with reduced production of IL-10, as well as of CCR1 locus rs7616215, an SNP in the 3′ noncoding region, and that it is associated with lower CCR1 messenger RNA (mRNA) expression and reduced monocyte chemotaxis . The result was unexpected because the low chemotactic ability of monocytes, which seems to be protective from inflammation, was identified as a risk for BD. This genetic findings do not directly correspond to previous functional studies that have shown excessive production of Mφ-derived proinflammatory cytokines, including tumor necrosis factor (TNF)-α, which is the most effective therapeutic target in BD [16, 17]. Additionally, our recent genetic study suggested that an effective target may be the IL1A–IL1B locus, which is related to enhanced IL-1β production from activated Mφ . Mφ polarization concepts have gained attention, especially in the field of tumor immunity . Further studies have revealed that Mφ are divided into two major subtypes with distinct functions: M1 and M2 Mφ. M1 Mφ are classical Mφ and play a proinflammatory role through the production of IL-6 and TNF-α, and they activate the Th1 cellular immune response, whereas M2 Mφ are nonclassical Mφ which produce anti-inflammatory cytokine IL-10 that suppresses inflammatory responses . The functional and phenotypic diversity of Mφ has been also investigated in physiological and other pathological conditions . Recent GWASs have identified IL10 and related genes as susceptibility genes associated with immune-mediated diseases such as IBD and SLE in addition to BD, suggesting the involvement of abnormal M2 Mφ function in the pathogenesis of these diseases . Indeed, dysfunction of M2 Mφ has been shown to exacerbate inflammation in a herpes simplex virus-induced BD mouse model . We previously revealed that downregulation of heme oxygenase (HO)-1, which is preferentially expressed as an M2 Mφ-specific anti-inflammatory protein, suggested M2 Mφ dysfunction in BD . These findings prompted us to analyze functional studies of Mφ polarization in human patients with BD. The results of the present study support the hypothesis that GWAS-identified CCR1 and IL10 loci contribute to impaired M2 Mφ function, which is partly due to genetic predisposition, and lead to M1 Mφ-predominant immune responses in BD. All of the individuals with BD in this study fulfilled the International Study Group (ISG) criteria for BD . The study protocol and genetic analyses were approved by the Yokohama City University Hospital Ethics Board (A140327015 and B131107009). All of the human samples were used after written informed consent was obtained. Peripheral blood mononuclear cells (PBMCs) were isolated by density gradient centrifugation using Lymphoprep (Axis-Shield, Dundee, UK). Human monocytes were isolated from PBMCs using the Human Monocyte Isolation Kit II magnetic-activated cell sorter (Miltenyi Biotec, Bergisch-Gladbach, Germany) according to the manufacturer’s protocol . Isolated monocytes were plated at a density of 5 × 105 cells/ml and were incubated in RPMI 1640 medium (R8758; Sigma-Aldrich, St. Louis, MO, USA) supplemented with 10% FBS (MP Biomedicals, Santa Ana, CA, USA) in the presence of either recombinant 20 ng/ml human granulocyte-macrophage colony-stimulating factor (GM-CSF) (215-GM; R&D Systems, Minneapolis, MN, USA) or 50 ng/ml macrophage colony-stimulating factor (M-CSF) (216-MC; R&D Systems) for 9 days to induce differentiation to M1 or M2 Mφ, respectively . Antibodies for CD68 (FITC 333806), CD163 (PE-Cy7 333614), and CCR1 (PE 362904) were purchased from BioLegend (San Diego, CA, USA). Incubation of polarized Mφ with antibodies was performed according to the manufacturer’s protocol. M1 and M2 Mφ were defined as CD68+CD163− and CD68+CD163+ cells, respectively. All the gates were determined using fluorescence minus one control. Data were collected on a BD FACSCanto II instrument (BD Biosciences, San Jose, CA, USA) and analyzed using FlowJo software version 10 (FlowJo, Ashland, OR, USA). Cultured cells were fixed on Nunc Lab-Tek chamber slides (Thermo Fisher Scientific, Waltham, MA, USA) with 4% paraformaldehyde. The slides and paraffinized skin specimens obtained from four patients with BD and four patients with systemic sclerosis (SSc) were deparaffinized in xylene, hydrated in ethanol, and pretreated with 10 mmol/L citrate buffer (pH 6.0). The cells and tissues were used for IHC analysis. Mouse monoclonal anti-CD68 antibody (PGM1; Dako, Carpinteria, CA, USA), anti-CD163 antibody (Leica Biosystems, Berlin, Germany), and rabbit polyclonal immunoglobulin G (IgG) anti-CCR1 antibody (GenWay Biotech, San Diego, CA, USA) at 1:100 dilution were used as primary antibodies. The REAL EnVision Detection System (Dako) was used with secondary antibodies for visualization by light microscopy . To count M1 and M2 Mφ in skin lesions, CD68+ and CD163+ cells were counted in three high-power fields (magnification × 400), and the average CD68/CD163 ratio was obtained in each patient. For double-immunofluorescence staining, Alexa Fluor 555 anti-mouse IgG (Life Technologies, Carlsbad, CA, USA) and Alexa Fluor 488 anti-rabbit IgG (Life Technologies) at 1:500 dilution were used as secondary antibodies. The slides were mounted with 4′,6-diamidino-2-phenylindole (Vector Laboratories, Peterborough, UK) and imaged by fluorescence microscopy. mRNA was extracted using the RNeasy kit (Qiagen, Hilden, Germany), and complementary DNA (cDNA) was synthesized using the SuperScript III reverse transcriptase (Life Technologies). Primers for real-time PCR of CD163 (Hs00174705_m1), CCR1 (Hs00174298_m1), CCR2 (Hs00704702_s1), IL6 (Hs00174131_m1), and IL10 (Hs00961622_m1) were purchased from Applied Biosystems (Foster City, CA, USA). GAPDH (4310884E) was used as an internal control when performing multiplex PCR. The comparative cycle threshold (2−ΔΔCt) method was used for the analysis of duplicate or triplicate reactions . Lipopolysaccharide (LPS) from Escherichia coli (serotype 0111:B4; InvivoGen, San Diego, CA, USA) was used at 1 μg/ml. After incubation for 24 hours, the supernatants were centrifuged and stocked at − 80 °C until use. The concentrations of TNF-α, IL-6, and IL-10 were quantified using the BD Bead Assay (BD Biosciences) in accordance with the manufacturer’s protocol. Transwell migration assay was performed using 5-μm pore polycarbonate membrane (Corning Costar, Kennebunk, ME, USA). M1 and M2 Mφ were cultured on RepCell (CellSeed, Tokyo, Japan) . After detachment of cells incubated at 20 °C for 30 minutes, the cells were used for the following experiments. M1 or M2 Mφ (5 × 104) were applied in the upper chamber. In the lower chamber, 1% bovine serum albumin (Wako Pure Chemical Co., Osaka, Japan)-supplemented RPMI 1640 medium with or without recombinant human MIP-1α (R&D Systems) was applied. After incubation for 2 hours, cells in the upper chamber were removed with Q-Tips, and cells on the bottom side of the membrane were stained with Diff-Quik (Sysmex, Kobe, Japan). Cells were randomly counted in 25 high-power fields. The migration index was defined as the ratio between the migrated cell counts with or without MIP-1α. After a 9-day incubation of monocytes from BD or SSc with GM-CSF or M-CSF, polarized M1 or M2 Mφ were further incubated in the presence of GM-CSF or M-CSF for another 9 days (Fig. 4a). cDNA was obtained after the 18-day incubation. Genomic DNA was isolated with the DNeasy Blood & Tissue Kit (Qiagen) or BuccalQuick (Trimgen, Sparks, MD, USA). A TaqMan SNP genotyping assay was used to identify SNPs associated with expression of IL10 (C___8828803_1_; Applied Biosystems) and CCR1 (C___1198110_10; Applied Biosystems) . Student’s unpaired t test was used to test statistical significance. A P value of < 0.05 was considered significant. One-way analysis of variance was performed to compare three groups, except for the groups that did not contain sufficient samples suitable for analysis owing to allelic scarcity. In the latter instance, we combined heterozygous with homozygous minor alleles and analyzed them using an unpaired Student’s t test. Statistical analysis was performed using Prism software (GraphPad Software, La Jolla, CA, USA). First, we tested the Mφ polarization protocol in peripheral monocytes purified from healthy control subjects (HC) according to a description in a previous report . M1 and M2 Mφ differentiation was induced from peripheral monocytes by GM-CSF and M-CSF, respectively. The cultured cells showed distinct morphological features between the two culture systems (Additional file 1: Figure S1A and B). We confirmed that both mRNA and CD163 protein, one of the conventional M2 markers, were elevated in M2- rather than M1-cultured cells (Additional file 1: Figure S1C and D) . Cytokine profiles after 24-h LPS stimulation revealed that M1-cultured cells produced a higher amount of IL-6, whereas M2- but not M1-cultured cells secreted IL-10 (Additional file 1: Figure S1E and F). Both types of cells did not synthesize a detectable level of either cytokine in the absence of LPS. These data indicate that both phenotypic features and cytokine profiles of cells derived from M1 and M2 conditions were compatible with those of M1 and M2 Mφ. Thus, we applied this protocol in the following experiments. Having established the Mφ polarization protocol, we compared CCR1 expression and IL-10 production, both of which are identified as BD susceptible genes, by M1 and M2 Mφ. We found that M2 Mφ showed higher amounts of CCR1 mRNA and protein than M1 Mφ (Fig. 1a and b). Consistently, immunocytochemical analysis confirmed that CD163 and CCR1 were more abundant in M2 Mφ than in M1 Mφ (Fig. 1c). We next looked at the association between IL10 and CCR1 mRNA expression and their corresponding BD-associated SNP genotypes. We found that BD risk allele was associated with decreased expression of both CCR1 and IL10 mRNA production in polarized Mφ. A significant expression quantitative trait loci (eQTL) effect was found only in M1 Mφ for CCR1 and IL10 for M2 Mφ (Fig. 1d and e). A recent study demonstrated that rs7616215 has a robust eQTL effect on CCR2, but not CCR1, in monocytes . However, the result was not replicated in our polarized Mφ assay (Additional file 1: Figure S2A). To examine whether the upregulated CCR1 expression is associated with enhanced chemotaxis against CCR1 ligands, we used a Transwell migration assay with gradient density of MIP-1α, a ligand for CCR1. We found that the migration of M1 Mφ into the lower chamber occurred in relatively higher MIP-1α concentrations than M2 Mφ (Fig. 1f). However, the migration of M2 Mφ into the lower chamber was more efficient at low concentrations of MIP-1α than M1 Mφ, whereas the chemotaxis was rather inhibited with higher concentrations of the chemokine (Additional file 1: Figure S3). Similar findings were reported previously in an unrelated study using this assay system . These findings indicate that increased CCR1 expression contributes to sensitive chemotaxis in response to low levels of MIP-1α in M2 Mφ. These results support the notion that BD-associated CCR1 and IL10 loci have the capacity to alter migration and anti-inflammatory cytokine production in polarized Mφ. To ask whether the CCR1 expression is affected by the disease itself, we compared the frequency of CCR1-positive M1 and M2 Mφ from HC and BD. To carry out this experiment, 21 patients with BD who fulfilled ISG criteria were enrolled. The background characteristics of the patients and HC are shown in Additional file 1: Table S1 and Table S2, respectively. The results showed that CCR1 surface expression of M1 Mφ was significantly increased in BD compared with HC (Fig. 2a), whereas no difference was detected in M2 Mφ (Fig. 2b). No significant difference between BD and HC was observed in CCR1 mRNA expression. The eQTL effects of rs7616215 on CCR1/2 mRNA and protein are shown in Additional file 1: Figure S2. The statistically significant allele-specific expression was seen only in HC. We confirmed that no statistically significant difference in CCR1 positivity was found between treatment with or without biologics, colchicine, or prednisolone (Additional file 1: Figure S4). We also investigated the number of differentiated Mφ between HC and BD, although no significant difference was observed between the groups (Additional file 1: Figure S5). IL-10 protein and mRNA expression in M2 Mφ from HC and BD is shown in Fig. 2d and e. IL10 mRNA expression was elevated in BD, whereas IL-10 protein production was comparable between BD and HC. The eQTL effect of rs1518111 on IL-10 protein and mRNA is shown in Additional file 1: Figure S6. Statistically significant allele-specific expression was seen only in HC IL10 mRNA. GWASs and our in vitro data suggested that GWAS-identified CCR1 SNPs confer significant eQTL effects in polarized M1 Mφ, which may lead to skewed Mφ polarization balance in BD local inflammation. To prove this concept, we performed IHC staining of erythema nodosum, which was pathologically diagnosed as septal panniculitis, from the lower limbs of a treatment-naïve patient with BD. We used skin lesions of SSc as a control, which was recently reported to be M2-dominant . As shown in Fig. 3a, CD68+ cells are predominant over CD163+ cells in skin lesions of patients with BD compared with patients with SSc (Fig. 3b). 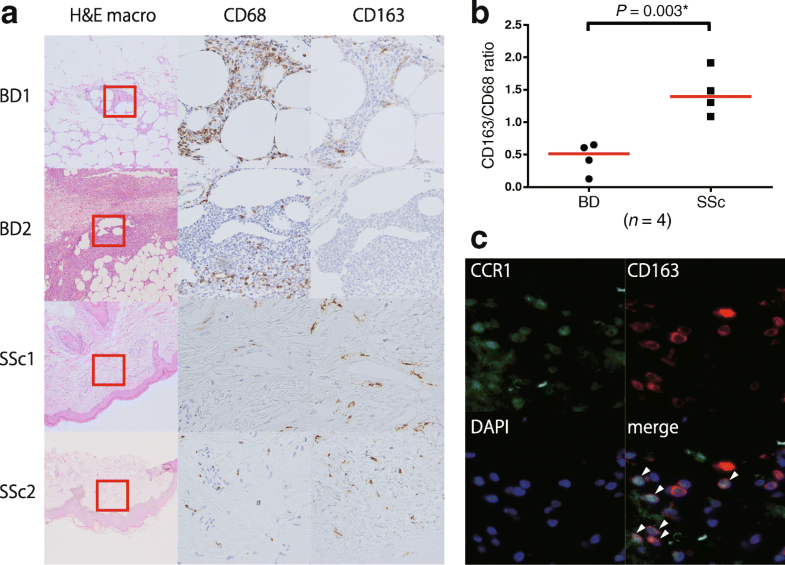 CCR1 and CD163 double-positive cells were found in the skin lesions of patients with BD (Fig. 3c). These results suggest M1 Mφ-dominant inflammation in BD. As shown in Additional file 1: Figure S1F, M2 Mφ have the capacity to produce IL-10, which has potent anti-inflammatory effects. Lower IL-10 production is a risk for not only BD but also ulcerative colitis  and other inflammatory diseases. IL10R-deficient patients experience oral ulceration and IBD, phenotypes resembling BD . It would be of great benefit for patients with BD and other inflammatory diseases if IL-10 supplementation restored M2 Mφ function at inflammatory sites, leading to a favorable clinical outcome. We tested whether established M1 Mφ could be converted into M2 Mφ in humans. To this end, the M1 and M2 Mφ that underwent 9-day in vitro polarization by GM-CSF or M-CSF were cultured for an additional 9 days in the presence of the same or other cytokines (Fig. 4a). Expression of CD163, IL6, IL10, and CCR1 mRNA was measured at the end of culture (Fig. 4b–e). We found that treatment with M-CSF, but not with GM-CSF, restored expression of IL10 mRNA with downregulation of IL6 mRNA. On the contrary, IL10 mRNA expression was decreased by GM-CSF in M2 Mφ. Thus, the final expression patterns of CD163, IL6, IL10, and CCR1 mRNA depended on the second cytokine rather than on the first one. The results suggest that Mφ phenotypes are partly but not completely interchangeable between M1 and M2 Mφ, depending on circumstantial factors, including cytokines. In the previous GWASs and subsequent genetic studies, associations of IL10 [4, 6, 14] and CCR1 [5, 34] loci with BD were independently replicated in multiple populations. Therefore, they are now considered bona fide loci involved in the pathogenesis of BD , though the pathological role remains uncertain regarding the functional basis. 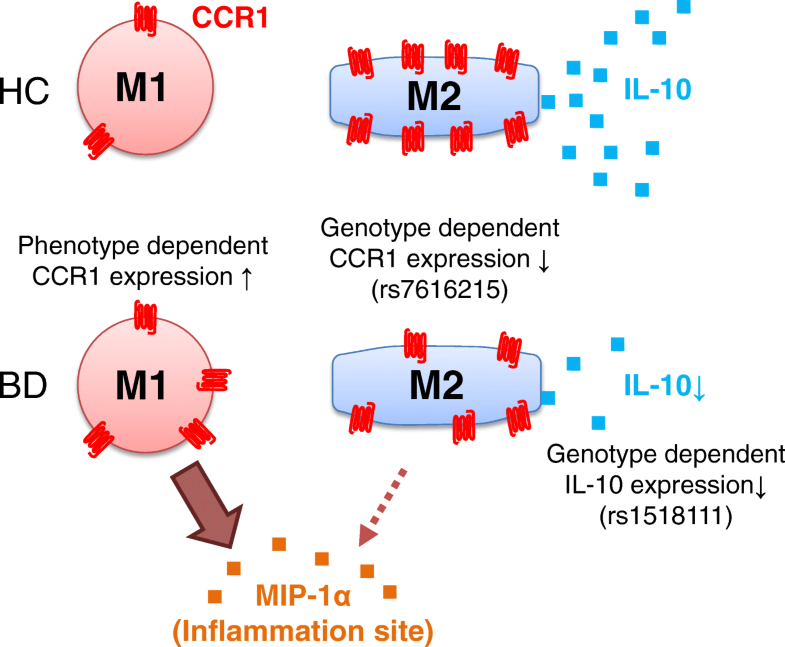 The present study shows that both IL10 and CCR1 genes were preferentially expressed on M2 Mφ, suggesting that the disease-susceptible SNPs of the genes are responsible for impaired migration of M2 Mφ into the inflammatory lesions and reduced local synthesis of IL-10 in BD. Thus, although IL10 and CCR1 SNPs are independently identified as susceptible loci of BD, it is likely that their pathogenic roles are summarized into the impaired M2 Mφ function in BD. Anti-inflammatory effects of IL-10 are mediated by HO-1, which was previously shown to be expressed on M2 Mφ preferentially [36, 37]. We have previously shown defective HO-1 synthesis to be associated with excessive expression of Toll-like receptor 4, another disease-susceptible gene product, leading to amplification of inflammation in patients with BD [23, 38]. These findings provided additional circumstantial evidence of impaired M2 Mφ functions in BD. Although biologics targeting IL-10 would be useful for the treatment of inflammatory diseases, there are no commercially available drugs that directly manipulate IL-10 levels in humans. In animals, enhancing M2 Mφ has been shown to be protective in several SLE models [39, 40]. It is plausible that a treatment strategy could be directed at enhancement of IL-10 production or local accumulation of M2 Mφ into inflammatory lesions, contributing to the improvement of clinical outcomes of BD. TNF inhibitors may lead to a relative enrichment of M2 Mφ by inhibiting M1 Mφ function, because we have previously shown that HO-1 mRNA expression in circulating monocytes is increased during treatment with infliximab in patients with rheumatoid arthritis . Alternatively, apremilast, a phosphodiesterase 4-selective inhibitor for which an international clinical trial for BD is ongoing, stimulates the production of IL-10 and downregulates that of proinflammatory cytokines . These findings suggest that clinical efficacy of these treatments is associated with corrected M1/M2 balance for BD, though direct evidence has not been provided to date. Because the disease-protective GG genotype of IL10 SNP rs1518111 and the CC genotype of CCR1 SNP rs7616215 in patients with BD were small, the power to identify mRNA expression differences was limited in BD samples. Effects of disease status or treatments could have affected IL-10 expression. The sample size was too small to identify small expression differences caused by the SNP. However, because SNPs tag common DNA haplotypes in human populations, data identified in healthy individuals would be applicable in BD pathogenesis. Further IL-10 and CCR1 transcriptional analysis is needed to clarify whether IL-10 and CCR1 expression may be dysregulated in BD. The examined cells are different; we evaluated M1 and M2 macrophages, whereas Ishigaki et al. evaluated human peripheral monocytes. The assay used to detect mRNA expression was different; we used real-time PCR, whereas Ishigaki et al. used RNA sequencing. The sample size is too small to identify CCR2 expression differences in our study. However, in our previous paper , we found a similar CCR1 eQTL pattern in human peripheral monocytes in samples from white Americans as well as in publicly available mRNA array data . These data support our hypothesis that rs7616215 affects CCR1 mRNA expression. We could not evaluate CCR1 genotype dependent migration differences in the present study for the following reasons: (1) 50-ml blood samples were needed to obtain a large-enough M1 or M2 macrophage count for the Transwell migration assay, and (2) owing to large experimental variation of the Transwell migration assay of polarized macrophages, a large sample size would be necessary to detect subtle effects caused by the common SNP. However, as we have previously shown significant migration differences by rs7616215 genotypes in human monocytes , similar migration differences may be found in human macrophages as well. Figure 5 shows our hypothesis based on the present study. M2 Mφ expressing high levels of CCR1 have the advantage of migration to inflammatory lesions, where CCR1 ligands such as MIP-1α are secreted, compared with M1 Mφ. Subsequently, the local inflammation is decreased by M2 Mφ in healthy individuals. However, the inflammatory condition would be persistent in patients with BD because M2 Mφ function is impaired by the genetic predisposition. Local accumulation of M2 Mφ is decreased owing to the reduced CCR1-dependent chemotaxis. Local IL-10 production would also be much less in patients with BD than in HC owing to the reduced number of M2 Mφ in addition to low IL-10-synthesizing capacity. 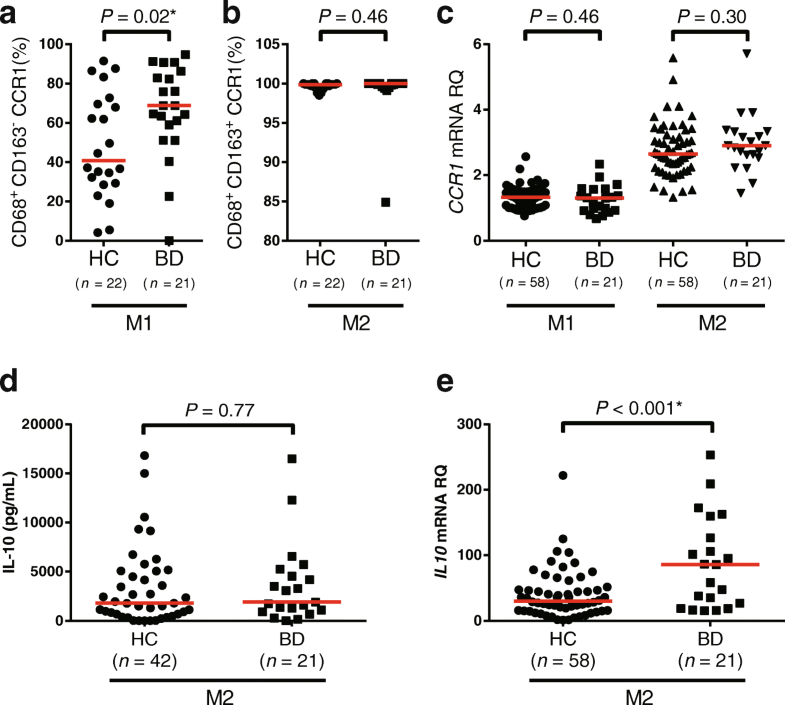 Furthermore, the frequency of CCR1-positive M1 Mφ is rather increased in patients with BD compared with HC, suggesting a more efficient accumulation of M1 Mφ into MIP-1α-enriched inflammatory lesions in BD than in HC. These unexpected findings may be caused by epigenetic or environmental factors . 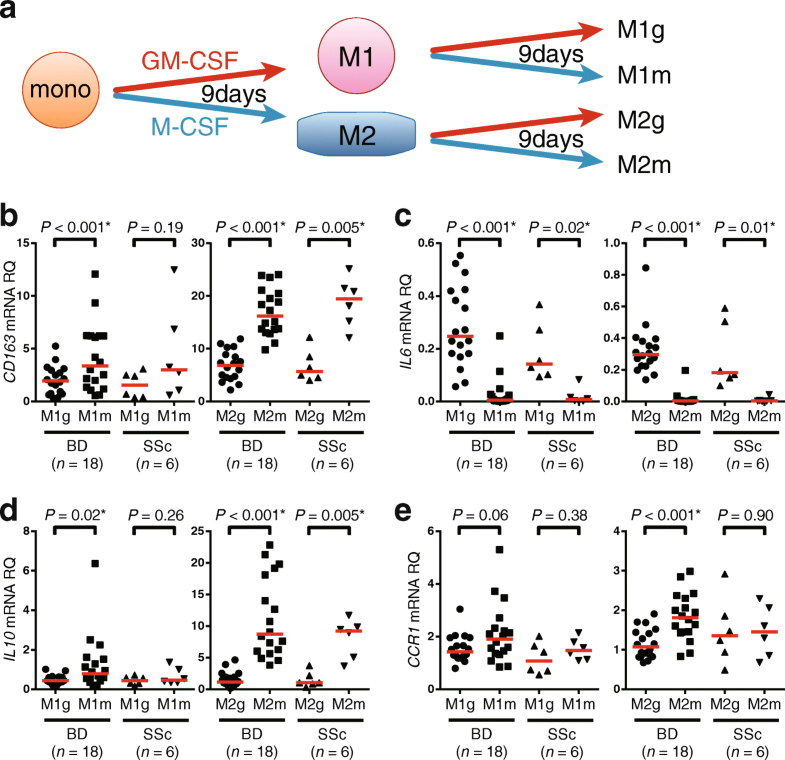 Taken together, both quantitative and functional balance between M1 and M2 Mφ shift toward M1-predominant type in inflammatory lesions, resulting in a vicious cycle of local inflammation. We added our new hypothesis to the previously proposed schema representing the pathogenesis of BD (Additional file 1: Figure S7) [45, 46]. Phenotypic plasticity of matured Mφ is an important issue for future study. Our data indicated that Mφ function was modified by M-CSF or GM-CSF at least in vitro. Particularly, we confirmed that in vitro polarized M1 Mφ restored IL-10 synthesis capacity in the presence of M-CSF. Even such partial modification of Mφ function would be beneficial for patients with BD. This study has some limitations. First, most of the data were obtained from in vitro experiments, which might not fully reflect the in vivo biological events in patients with BD. Second, because biopsies of affected lesions in BD are not routinely done for the diagnosis of BD, only small numbers of skin biopsy specimens could be evaluated. In addition, the timing of skin biopsy in the disease course may influence the balance between M1 and M2 Mφ. Finally, most of the patients with BD were receiving some of the therapeutic agents, which might have affected the results of in vitro culturing. However, the 9-day in vitro polarization protocol may have minimized the influence of the therapeutic agents, as shown in Additional file 1: Figure S4. Nonetheless, our data reveal the difference in CCR1 expression of M1 Mφ between patients with BD and HC. The present study shows that BD-associated CCR1 and IL10 loci are responsible for defective M2 Mφ, resulting in skewed M1 Mφ polarization in BD. Our data suggest that phenotypic plasticity is partially conserved in matured M1 and M2 Mφ. Strategies to correct the imbalance between M1 and M2 Mφ or to modify Mφ function would be promising for patients with BD in the future. This study was supported by grants from the Japanese Society for the Promotion of Science Grants-in-Aid for Scientific Research (26713036 [to YK], 26461469 [to MT], 26461468 [to RY], and 16K19085 [to IK]), the Yokohama Foundation for Advancement of Medical Science (to YK and RY), the Naito Memorial Foundation (to YK), the Uehara Memorial Foundation (to YK), the Japan Intractable Diseases Research Foundation (to YK and MT), the Japan Rheumatism Foundation (to YK), and the Takeda Science Foundation (to RY). We express our gratitude to Momoko Ohno and Masato Kawashima for their assistance and Tom Kiper for correcting the grammar of this paper. This study is supported by grants from the Japanese Society for the Promotion of Science Grants-in-Aid for Scientific Research (26713036 [to YK], 26461469 [to MT], 26461468 [to RY], and 16K19085 [to IK]), the Yokohama Foundation for Advancement of Medical Science (to YK and RY), the Naito Memorial Foundation (to YK), the Uehara Memorial Foundation (to YK), the Japan Intractable Diseases Research Foundation (to YK and MT), the Japan Rheumatism Foundation (to YK), and the Takeda Science Foundation (to RY). H Nakano performed experiments, analyzed data and wrote the manuscript. KH, H Nakajima, YY, and IK performed some experiments. MT, RY, IA, and H Nagai coordinated the research and critically revised the manuscript. YK conceived of the experimental design, analyzed data, and wrote the manuscript. All authors read and approved the final manuscript. The study protocol and genetic analyses were approved by Yokohama City University Ethics Board (A140327015 and B131107009). All of the human samples were used after written informed consent was obtained. MT serves as an advisor for the apremilast clinical trial for Celgene.